We are here to help you achieve your real estate dreams! UPTOWN SERVICE! DOWN HOME VALUES! We are Anne and Rich Selle and we have been providing professional real estate service for over 30 years. We began selling resort real estate in Summit County Colorado in the mid 1980's & have been doing it full time since then. 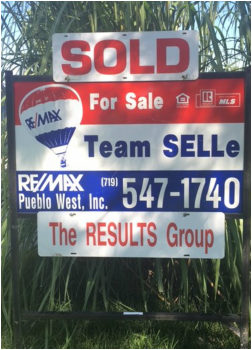 We moved to Pueblo West in 1994 and began with RE/MAX at time. Our office is located in Pueblo West but our service area includes all of Pueblo County. We continually work on keeping our skill levels and technology current. We feel our marketing is as effective and professional as any available. Our style is not high pressure but we are persistent and will work until either your buying or selling goals are achieved! WE GET RESULTS! We are conveniently located about .75 miles south of Highway 50 at the Main McCulloch Blvd. exit. We are the only real estate company that has had a formal office location in Pueblo West, through good and tough market conditions. BUYING OR SELLING - CONTACT US! We specialize in real estate services in Pueblo West and Pueblo, Colorado.